What are you doing Friday night or Saturday? If you're free, and you're in Santa Cruz, you might want to stop by Cameron Marks, a beautifully curated boutique on the Westside, where a unique trunk show will be underway. At the forefront of the event will be jewelry designed by Nicole Rimedio of Variance Objects. 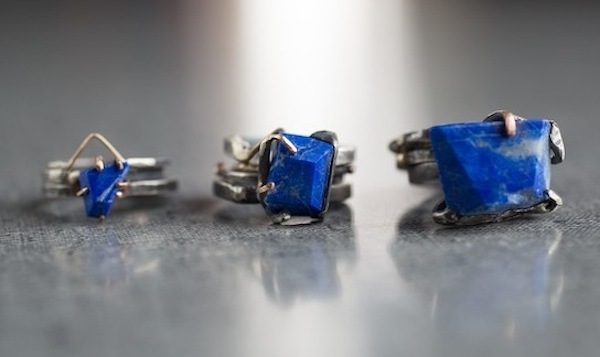 Items like the above lapis rings, which I can't stop staring at, will be for sale, along with many other one-of-a-kind jewels. With an earthy, modern aesthetic, these baubles add a pop of color and originality to any outfit. Come meet the designer and enjoy champagne on Friday night and a tea service on Saturday. Also, score 20 percent off of the entire line. Cameron Marks is located at 402 Ingalls St., No. 7, Santa Cruz.